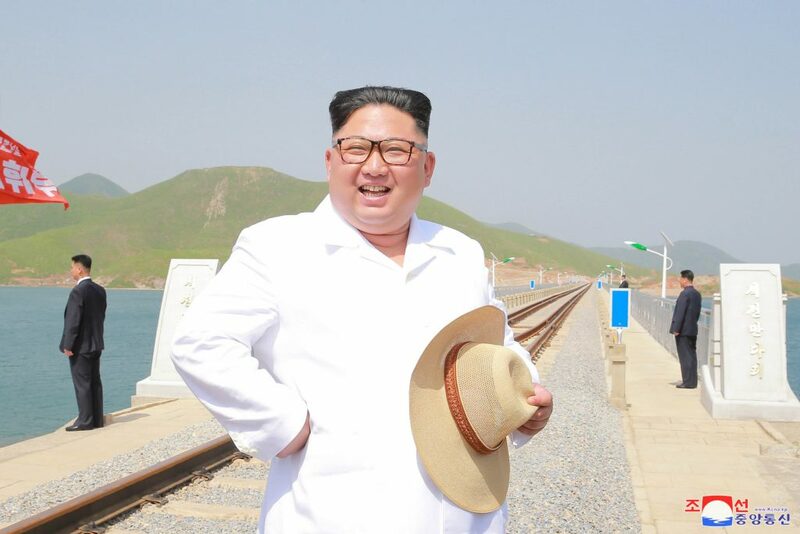 Kim Jong Un smiles at the end of a recently completed railway bridge in Kangwo’n Province (Photo: Rodong Sinmun). 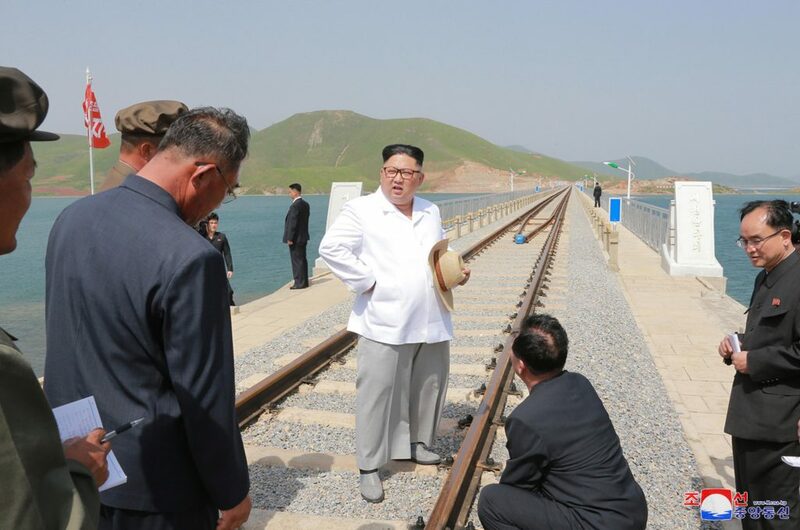 DPRK state media reported on May 25 (Friday) that Kim Jong Un (Kim Cho’ng-u’n) inspected the Koam Tapch’o’n Railways on the DPRK’s east coast in Kangwo’n Province. 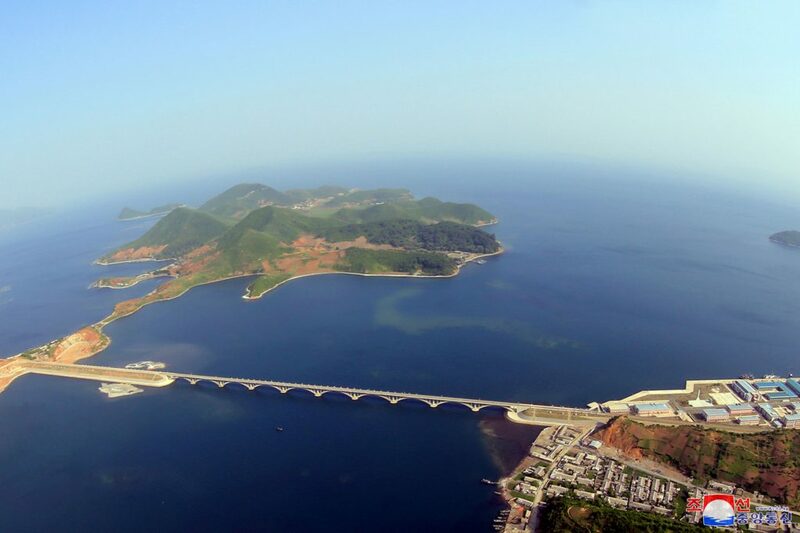 Also in attendance were Workers’ Party of Korea [WPK] Finance and Accounting Department Director Kim Yong Su (Kim Yo’ng-su), Personal Secretariat deputy chief and WPK Organization Guidance Department Deputy Director Jo Yong Won (Cho Yo’ng-wo’n), Kangwo’n WPK Provincial Committee Chairman Pak Jong Nam (Pak Cho’ng-nam) and Kim Tong Gyu. 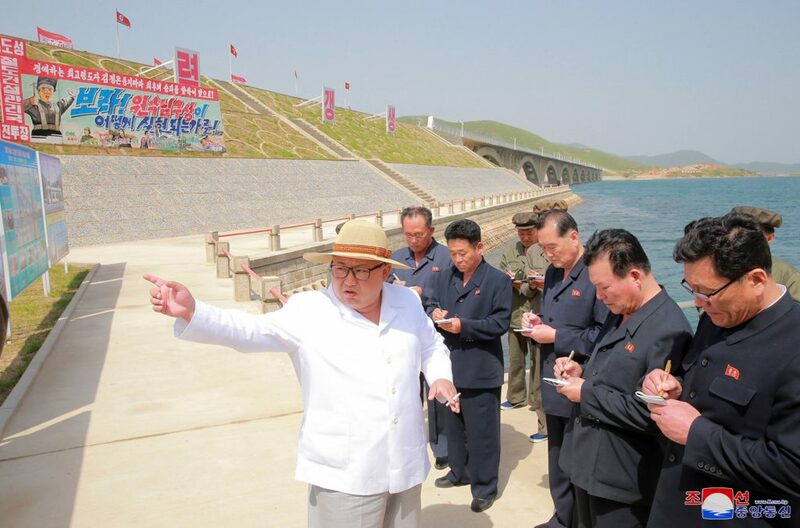 Kim Jong Un is briefed about the bridge construction (Photo: KCNA/Rodong Sinmun). 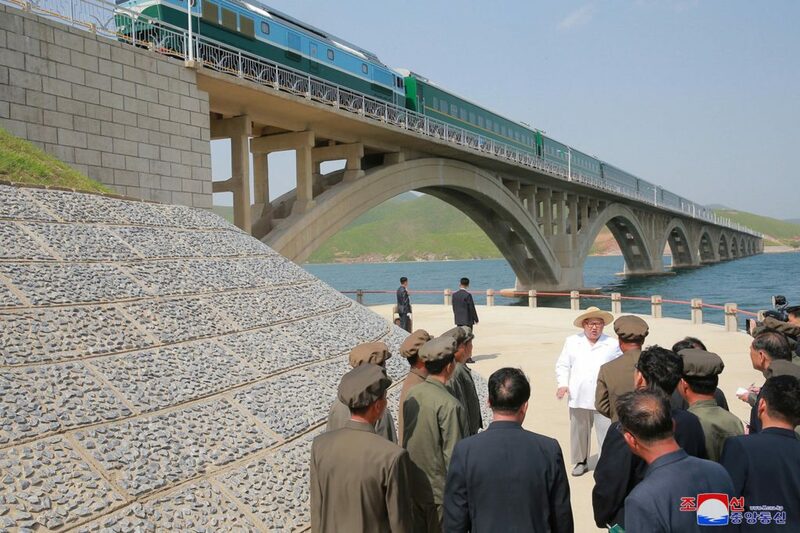 Kim Jong Un and senior WPK officials tour the construction. 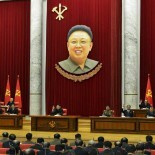 His personal bodyguards from the Main Office of Adjutants are visible in the background (Photo: KCNA). 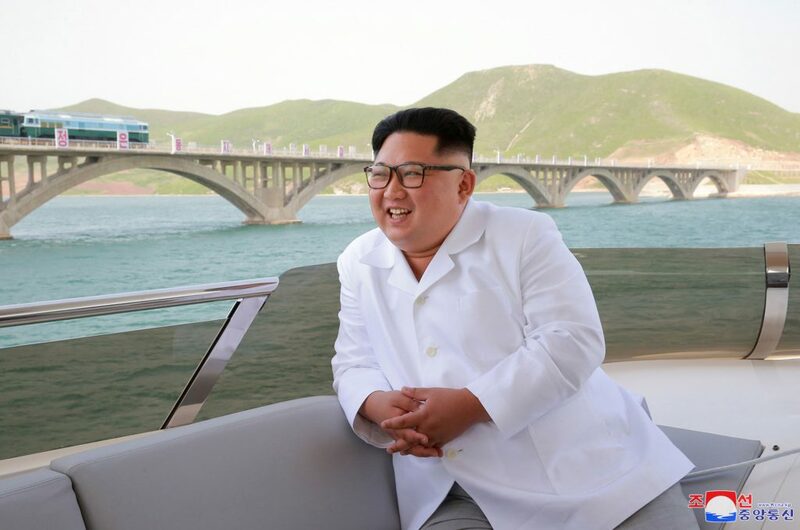 Kim Jong Un looks over the construction in the Koam-Tapch’o’n area of Kangwo’n Province from his personal boat (Photo: Rodong Sinmun/KCNA). 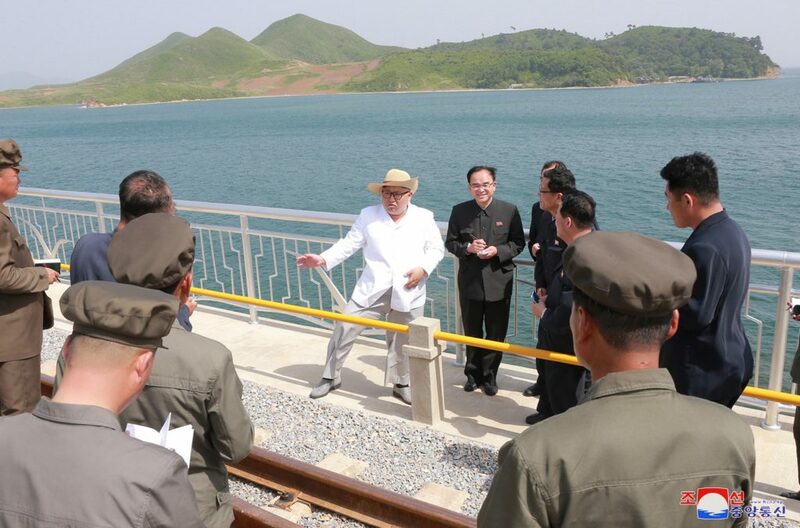 Kim Jong Un talks about the construction of the railway and fisheries on Sokjon Bay (Photo: KCNA/Rodong Sinmun). 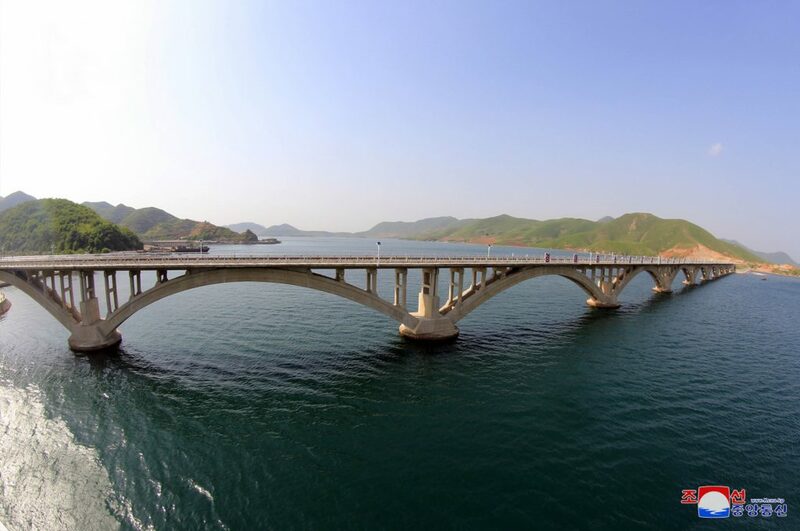 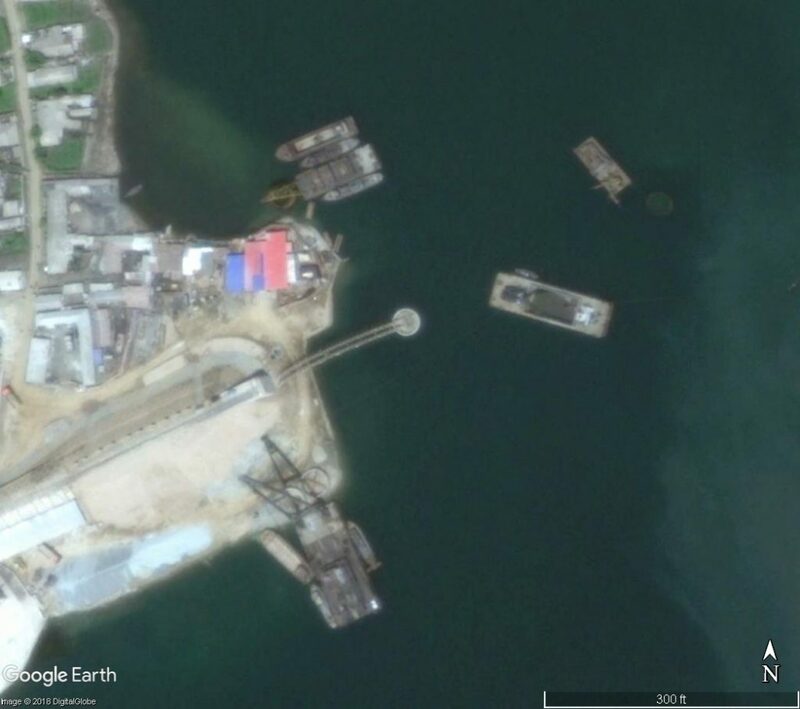 This article was written on 25 May 2018, and is filled under "self-development first" slogan, basic party organizations, capital construction, Central Committee, Central Military Committee, Comprehensive Affairs, county/city party organizations, critical infrastructure, DPRK Cabinet, DPRK fishing industries, Economic Complexes, Events Management Section, Executive Policy Bureau, Finance and Accounting, Financial Planning Department, Five Year Economic Plan and Development Strategy (2016), food production, General Affairs, Guard Command, ideological slogans, Jo Yong Won, Kangwo'n Provincial KWP Committee, Kangwo'n Provincial People's Committee, Kim Chong-un inspections, Kim Family, Kim Jong Un Visits, Kim Jong-un, Kim Yong Su (WPK CC DD), KJI Personal Secretariat, Korean People's Internal Security Forces, Korean People's Army (KPA), Korean Workers' Party (KWP), KPA construction battalions, KPA construction brigades, kpif, Local Party Affairs, local people's committees, military security command [msc], Minister of People's Security/KPISF construction units, Ministry of Construction and Building Materials Industry, Ministry of Fisheries, Ministry of Food and Consumer Goods, Ministry of Food and Procurement, Ministry of Foodstuffs and Daily Necessities, Ministry of Labor, Ministry of Land and Marine Transport, ministry of people's security, Ministry of Railways, Ministry of State Construction Control, Ministry of State Security, Ministry of the People's Armed Forces (MPAF), Notification, Organization and Guidance Department, Pak Jong Nam (Kangwon WPK PC), party life, Political Bureau, primary party committees, Propaganda and Agitation Department, Provincial Party Committees, Provinicial People's Committee, Secretariat, State Affairs Commission, State Planning Commission (SPC), State Security Department, transportation, transportation--railways, water facilities, Workers' and Social Organizations, WPK Economic Affairs Dept.